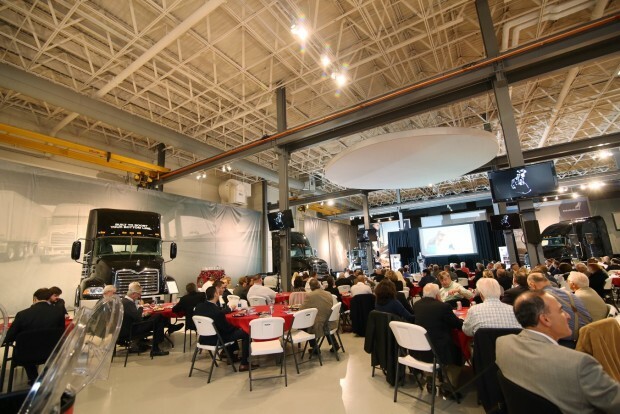 Mack Trucks has a long and rich history in the Lehigh Valley and, as the company made clear during the Lehigh Valley Economic Development Corporation’s (LVEDC) fall signature event, it plans to continue its presence here long into the future. More than 200 people attended LVEDC’s Fall Signature Event today, entitled “Mack Trucks in the Lehigh Valley and in the World.” Each year, this event will spotlight an existing company in the region that exemplifies a particular industry, in this case manufacturing. 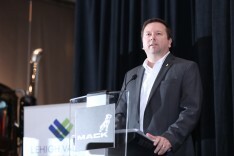 Speaking at the Mack Trucks facility in Lower Macungie Township, LVEDC President and CEO Don Cunningham noted that manufacturing is strong in the Lehigh Valley, making up $4.95 billion of the region’s gross domestic product, or 14 percent of our total $35.4 billion GDP. Mack Trucks builds all of its trucks for the North American market in the Lehigh Valley, and last year enjoyed the biggest output its plant has ever seen. The facility produces 116 trucks a day. Mack Trucks has shown an overall trajectory of growth from 1986 to 2014, despite a few “peaks and valley” from year to year. The company anticipates the sale of 310,000 total North American Class 8 trucks in 2015. Cunningham noted that Mack Trucks is a significant part of why the Lehigh Valley GDP has reached an all-time high. The manufacturing portion of the GDP grew by 4.1 percent over the previous year, making the region at 64th largest output of manufacturing out of 351 major metropolitan areas in the Lehigh Valley. The Lehigh Valley facility employs 1,866 workers, up from 812 in 2009. Volvo Group, the parent company for Mack Trucks, employes about 100,000 people around the world. Watson also discussed Mack Trucks’ plans for growth at its Lower Macungie Township facility. The company plans to improve the facade and docks of the existing facility over the next two years, which he said will result in improved flow, shorter customer lead time, and higher capacity. “We want to further expand our presence in the market, we want to be socially responsible citizens, and we want to be deeply involved in the community,” he said. Watson discussed the transport solution technology that go into the company’s trucks, including adaptive cruise control, anti-collision systems, sensor to improve safety and efficiency, and cellular connectivity to monitor the performance of the vehicle. He also discussed future technology in the pipeline, including automated driving vehicles, and the ability for trucks to foresee upcoming terrain using geographic location and adjust accordingly.